As of this week, an inquiry is underway into the eviction of residents of Lwandle, in the Western Cape, at the beginning of June. The issue became a shameful political football, and the inquiry – ordered by Human Settlements Minister Lindiwe Sisulu – aims to get to the bottom of exactly what happened. But if the inquiry is to have any meaningful impact, it must address far wider issues than who should take the blame. By REBECCA DAVIS. The destruction of shacks in the Nomzamo informal settlement made the front pages of newspapers in early June. 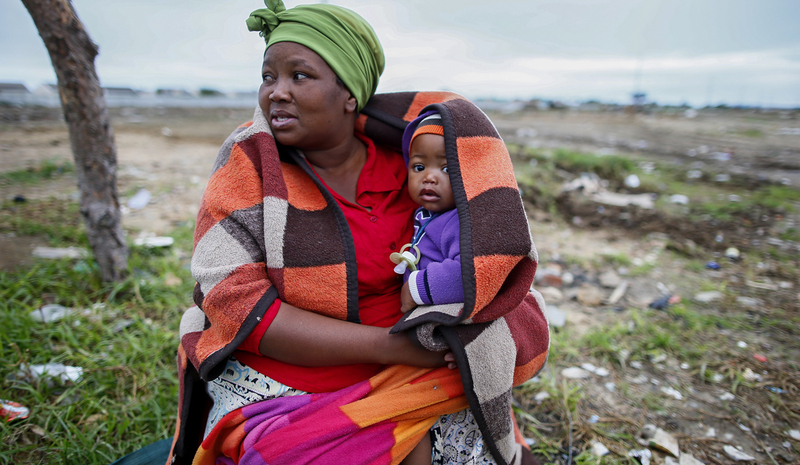 Heartrending photographs of residents pleading for their homes not to be demolished caused outrage, especially as the demolitions took place just as an unforgiving cold front hit Cape Town. It didn’t take long for the blame game to start. The ANC pointed the finger squarely at the City of Cape Town, suggesting that the evictions were a punishment to the community for not having voted for the DA in the elections. Human Settlements Minister Lindiwe Sisulu said that Western Cape Premier Helen Zille should have taken responsibility for Lwandle residents from day one. The City of Cape Town responded that the land from which the residents were evicted was owned by Sanral, the South African National Roads Agency, and it was this government agency which had obtained a court interdict against the illegal occupation of their land. The City hinted that it was Sanral which was operating out of a sense of revenge against the City over a dispute about proposed tolls on the N2. Zille stated in her SA Today newsletter that the role of “people’s rights movement” Ses’khona in the issue was also highly questionable, since she claimed that settlers on the Sanral land had been required to pay a membership fee to Ses’khona in order to obtain a plot. “The 2016 local election campaign has begun,” Zille wrote. “That is the prism through which to understand the Lwandle occupations and evictions”. Zille also asked, legitimately, why other evictions (such as those taking place in Alexandra at the same time) had not attracted similar attention. Cape Town civil society organisations, meanwhile, condemned the politicking on all sides and the “callousness” of both Sanral and the City. They also pointed out that the City had sent a letter to Sanral in late January instructing the agency to “rectify the situation” of illegal structures erected on Sanral land. This issue – crudely put, that better-off Western Cape residents do not want the shack-dwellers living nearby – continues to trail the Lwandle residents. The evicted residents have been living in a nearby community hall, but have at various points been made empty promises as to their next move. A Sanral-owned field in nearby Blackheath was initially offered to the Lwandle residents to re-build on. But the predominantly coloured residents of Blackheath were having none of it, saying that they refused to have “squatters” in their area. Their reported concerns were virtually identical to those of the Strand Ridge residents. One Blackheath resident told the Cape Argus: “Our children will be coming out from school and using this road. Who knows what will happen to them…We don’t want these people here.” Unwanted again, the Lwandle residents were bundled into taxis and returned to their temporary home in the Nomzamo community hall. A new plan was announced by Cape Town Mayor Patricia de Lille: the City would house the Lwandle families in a major new housing development in Macassar. This caused violent protests among backyarders in Macassar, who complained that they had been waiting for houses longer, and that it was “their area”. The City subsequently backtracked, saying that De Lille had been fed the wrong information, and that the land was already earmarked for another project. Now it emerges that the Lwandle residents are to be moved back to the original Sanral-owned land. This was the word from Housing Development Agency manager Bosco Khoza on Monday, speaking at the inquiry into the Lwandle evictions. They will return to marginally improved conditions: this time round, there will be basic sanitation facilities and concrete floors. The inquiry, which is headed by advocate Denzil Potgieter, is tasked with investigating all circumstances under which the evictions took place. This includes the obtaining of the court order by Sanral, the execution of the evictions, the role of law enforcement officials and any other provincial officials. It must also establish the identity of the members of the informal settlement and the history of how they came to the land. The issue of how many people were affected by the evictions is still contentious. Khoza says that the families claim the affected families number 849, while the sheriff responsible for overseeing the evictions says 234 shacks were destroyed. Khoza indicated that officials are going with a middle-ground number of 402 destroyed structures, which is unlikely to appease a community which claims twice this number were affected. Deputy Director General of Human Settlements Mbulelo Tshangana acknowledged that talks with the community had been a “very difficult exercise”, saying that there was “a lot of mistrust”. The first phase of the inquiry deals with the role of national government housing officials, followed by the City of Cape Town. At a later stage the inquiry will hear from community members themselves, when the inquiry moves to a location more convenient for their participation. When Minister Sisulu announced the establishment of the inquiry last month, she said: “We must start by putting it on record that we do not tolerate, condone nor encourage any illegal occupation of land in our country.” But she stressed: “Evicting people illegally is also wrong and South Africans have to get to understand you can’t get away with doing wrong”. Beyond forcing one entity of another to “take responsibility”, however, Sisulu also said that she wanted to understand how people had come to live on the Sanral land given that there was a waiting list for the provision of government housing. But as a report by the Socio-Economic Rights Institute (SERI) and the Community Law Centre (CLC) made clear last year, the ideas of both a “housing list” and “queue-jumping” are largely mythical in the sense that many South Africans understand them. The criteria for ordering the list has been changed several times; waiting-list data is often out-of-date; in some areas numerous waiting lists have been drawn up; and fraud often allows people to circumvent the allocation system. The fall-out from the Lwandle issue clearly indicates that officials have not observed these warnings. The Lwandle fiasco illustrates the levels of confusion among the public about the process of who gets a house, and how, and the handling of the matter has likely exacerbated this. It is not hard to understand the grievances of the Macassar community at the prospect of Lwandle residents being allocated houses ahead of them purely on the basis of having undergone a high-profile eviction from land they were illegally occupying. If the Lwandle inquiry is to make a significant contribution to ensuring that these types of scenes happen less frequently, it should urgently address itself to the issue of public understanding of the housing allocation process. The deeply-ingrained discomfort of the better-heeled South African public at living in close proximity to informal settlements is also something that the Lwandle inquiry is unlikely to be able to address meaningfully, though it goes to the heart of who we are as a nation. The truth is that what happened at Nomzamo, and its aftermath, is by no means a singular story. The issues underlying it cannot be solved simply by shunting a group of residents back to the land they were evicted from in the first place, or by determining which branch of government has the most egg on its face at the end of the day.